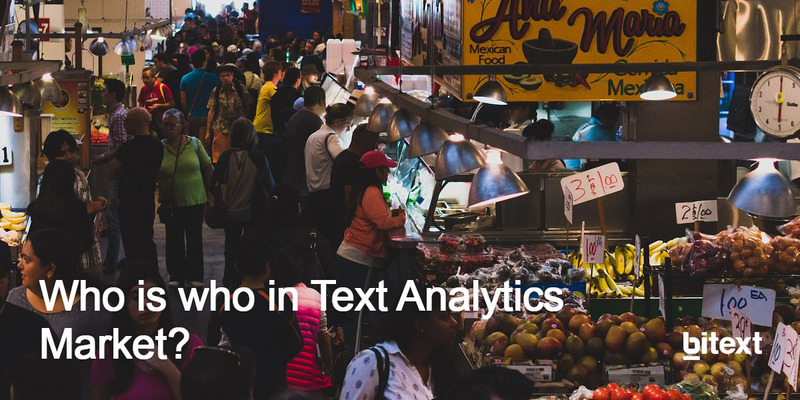 Text analytics is the process of driving business insights from text sources such as emails, social media or surveys. As in every field, there is not only one service provider, text analytics vendor landscape is quite fragmented, according to Forrester there are more than 40 companies offering similar services. However, there are significant differences in terms of technology and features what will influence the final result. How long have they been in the market? Who is their customer type? Do they have data visualization? How many languages do they offer? Aylien: based in Dublin they have been on the market since 2010. They are mainly oriented to developers and technical profiles. Instead of focusing on core technology they offer a wide variety of products under their API: sentiment analysis, concept, entity and article extraction, classification or hashtag suggestion. As per the languages, they offer English, German, French, Italian, Spanish and Portuguese. Alchemy API: they were one of the first ones in the market, they started offering their API in 2005 mainly to developers, they are very focused on the technological aspect of their tool but they don't offer data visualization. Their service offer includes: sentiment analysis, taxonomy and entity extraction. Alchemy offers their services in many different languages however not all the services are offered in every language. Lexalytics: founded by Jeff Catlin and Mike Marshall they have been operating in the market since 2004. Their services cover not only developer’s needs but also business users. Lexalytics offers different services such as categorization, entity extraction, and sentiment analysis. These products are available in a SaaS version and On-premise. The results can be visualized on an excel sheet. As Alchemy, Lexalytics offers their services in a wide variety of languages. Clarabridge: with their headquarters in Virgina, they have seen a worldwide expansion over the last years. Their products target mainly marketers and customer insights experts. Their key differentiation, against the core technology that other providers offer, is the clear visualization while analyzing the results. Clarabridge offers their solutions in different languages. Bitext: was founded in 2008 and since then has been developing its text analysis tools focusing on the linguistics side of the challenge. Last June we launched our CX for marketers and customer insights officers, and for over a year now our API for developers has been live. As per services we offer sentiment analysis, text categorization, entity extraction and concept extraction in 8 languages, not counting the custom ones. The CX results can be downloaded into a data sheet but we will get you good news on this area very soon. If you thinking about visualization you are quite right! Do you know how they performance against each other? Download our report!